Pineapple Express) have met that challenge, delivering a dramatization that is not only very accurate, but transports the audience to see and feel Ralston’s predicament, his suffering, despair, and ultimate triumph. 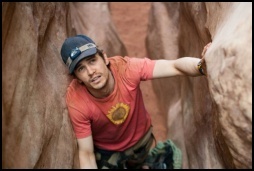 The story made headlines at the time and the premise is now well-known: Out for a weekend of canyon-climbing, Ralston accidentally dislodges a boulder and ends up with his hand pinned by the boulder at the bottom of a slot canyon. one where he was going, Ralston is suddenly faced with the type of situation few ever survive. Though the film is a dramatization, Boyle and his crew took great pains to portray the events accurately. In a recent BBC interview Ralston remarked that upon first seeing the film he was so caught up in its realism that he felt he was there again and found himself weeping through most of the film. Boyle took pains in even some of the smallest details: The rescue helicopter and pilot seen at the end of the film, for instance, were the actual helicopter and pilot who swooped in to rescue Ralston in 2003. When this film first opened in a few cities two weeks ago, much was made of reports of people fainting during one bloody scene at the climax of the film at the first Toronto screening. This reviewer can only conclude that there must have been some particularly squeamish people at that screening. The scene of Ralston’s self-amputation is indeed bloody and certainly both shocking and painful to watch, but the gore is not played up and the scene is kept short. That scene felt to this viewer like the minimum necessary to portray something of what Ralston went through, which in real life took more than an hour rather than the very few minutes on film. And it is nothing like the orgies of blood and gore seen in many popular action and horror films. volunteer who should have known better, was indeed very heroic in his actions, but was in his predicament only because of his own dumb mistakes and carelessness. Whether that’s a valid criticism I’ll leave to the reader, but certainly the film serves as a superb object lesson on many things not to do (including drinking one’s urine — never, ever do that, no matter how thirsty). Perhaps, in the long run, serving as a strong lesson on the value of wilderness preparation and forethought may be the film’s greatest value. and acting but also with first-rate cinematography and an excellent original score. Overall, a film not to miss. Filmed on location near Moab, Utah. 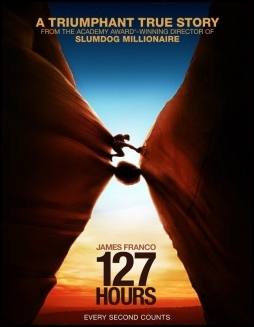 Film Review: 127 Hours was written on November 20, 2010 and filed in Musings.